Apprentice winner Alana Spencer's cake company has had to recall almost all of its range because of health risks. Food Standards Agency investigators said Ridiculously Rich by Alana inaccurately labelled its products. Some allergens were not listed and others were "not correctly declared", the agency said. A spokesman for the Aberystwyth company insisted only products sold online - less than 10% of its business - had been inaccurately labelled. But the FSA's advice to the public does not distinguish between products the company sells online or through retail and wholesale outlets. It warned that people with an allergy to soya, egg, peanuts, wheat, barley, oats or sulphites were at risk. How long can The Apprentice keep running? The FSA identifies inaccurate labelling on seven of the eight cakes and bars currently advertised for sale on the Ridiculously Rich by Alana's website. The one product not highlighted as a risk by the FSA - spiced apple flapjack - is sold in mixed boxes with brandy butter brownies, which are on the list. The warning only applies to products made before 1 December this year. The company's spokesman said it had now corrected its labelling and contacted everyone who had bought its products to invite them to return their purchases free of charge for a replacement or refund. No-one has yet returned any products, the spokesman said. He declined to disclose the number of items sold with inaccurate labels. On its website, the FSA listed the products with inaccurate labelling and advised customers: "If you have bought any of the above products and have allergies to soya, peanuts, nuts, eggs and/or an allergy or intolerance to wheat, barley, oats (gluten), milk and/or a sensitivity to sulphites do not eat it. Instead return it to the store from where it was bought for a full refund." An FSA spokesman said it was working with the company and Ceredigion council "to ensure that clear allergen information is available to consumers who may have purchased products with inaccurate or insufficient information." Ms Spencer was unavailable for comment, her company's spokesman said, as she was "filming". The spokesman added: "Lord Sugar was made aware of the situation immediately. "He's spoken to Alana and is satisfied she has put the right measures in place to avoid a situation like this again." 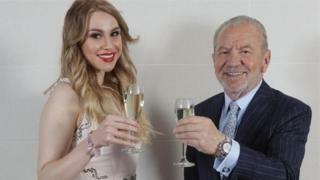 Image caption Lord Sugar was made aware of the problem "immediately"
Ms Spencer, 25, shot to fame last year when she won BBC television's The Apprentice. Her victory in the 12th series of the show secured her a £250,000 investment and a 50/50 business partnership with Lord Sugar. The company's range includes brownies, flapjacks and fudge cake and products cost £12.99 for a box of six.